Located in Perth CBD community, Northbridge Chiropractic is home to Dr. Kim Prater and Dr. Valentin Payet. As extremely active youth, both Dr. Kim and Dr. Prater became appreciative of chiropractic care at a relatively young age. With a love of athletics that has continued into their lives today, both doctors share a passion for physical health and seek to provide treatments for common ailments that occur in everyday life. Because both doctors believe in the power of chiropractic care, Northbridge Chiropractic offers extended office hours into the evening to ensure patients won’t have to take time out of their busy days to seek the benefits that chiropractic care has to offer. To ensure their patients receive the best care possible, appointment times are usually longer than other practices in the area, allowing both doctors to provide an unparalleled level of treatment. 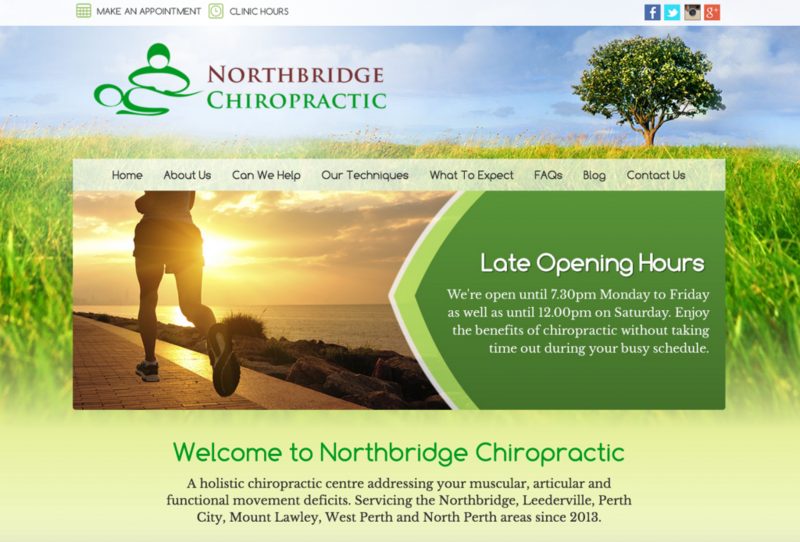 As a premium client, Northbridge Chiropractic in Perth CBD received a fully custom website complete with unique content, a blogroll, and much more.